Please also see the comments to this post, interesting! reach Europe – and many may have thought that “well all that’s what the poor people have to cope with there in the South, Sicily, Turkey, Greece.” But guess what: some refugees have opened the Arctic route for entering Europe. Colleague Patty Gray just alerted me to this article in the New York times, entitled “Bypassing the Risky Sea, Refugees Reach Europe Through the Arctic” by Andrew Higgins, check it out. As sad as it is that these people have to travel all the way up to the Arctic where they hardly intend to stay – this is probably an amazing case study for an ethnography of cross-border relations! As Anna Stammler-Gossmann has written, Arctic Russian border crossings like this were used by shuttle traders to bring car tyres, coffee, and clothes to Russia. Now it’s people, and different from the southern European borders, they don’t need criminal people-traders to bring them. They can cross the border themselves! To be honest, several times already I was annoyed by this practice at the border that you are not allowed to cross it on foot. Therefore the poor refugees have to buy bicycles in the closest Russian town, Nickel’, just to cross the border and then get them confiscated by the Norwegians! What’s that good for? Above all, my cyclists’ heart hurts when I see all these nice bicycles piled up. But maybe someone doing an ethnography of this new migration route would identify this as modern-day resource distribution – but from refugees to one of the world’s richest countries – Norway. This entry was posted in All, Fennoscandia, Russian North and tagged cross-border trade, Migration, northern cycle route. Bookmark the permalink. 4 Responses to Arctic refugee lived experience: Northern Sea Route? Walking route? Cycling route? Motor (Lada) route instead? I just have been for a weekend in Grense Jakobselv, the northernmost point of the Russian-Norwegian Border. We met two Norwegian border guards sitting at a fireplace right at the border, some 50 km north of Storskog. They told us about the new flow if Syrian migrants, and I was amazed. But I didn’t realise how big the flow of people already is. 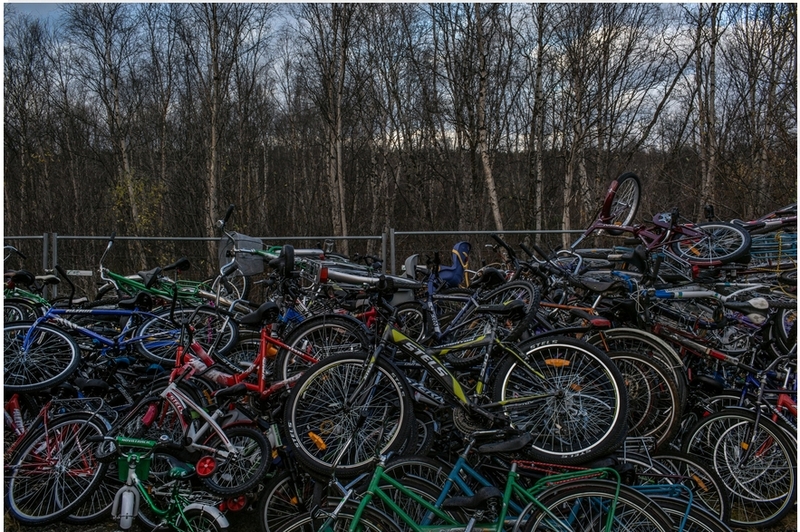 The confiscation of brand new bycicles “made in Russia” due to Norwegian safety standards (as said in the NY Times article) is certainly a pure formalism, with the real aim to limit the mobility of the refugees once they are in Norway. Tourists have been crossing the border many times with their bikes, among them also many Russians with Russian bikes. From the temporary shelter to the next shop there will be daily dozens of people carrying their bags with food supply for several kilometers (as I can see them in Rovaniemi, my hometown). Another news piece on this in the local media in Norway. Even more than the movement of people proper, what is interesting in this on the long run is of course the effects of this movement for the moved, and for the hosts as a society. If ever somebody thought about applying for an ethnographic project on this – now would be the perfect time. For example taking one case study, one village, and trace the processes of arriving, setting in, and maybe moving on for the people, as well as the dynamics of social change that this influx causes in the village. But unfortunately, many of us are busy with our own other ideas, so I share this idea here, if someone wants to take it up. In the Arctic Centre Nafisa Yeasmin has projects on this topic – but there the orientation seems to be very different: very applied, aimed towards integration, rather than anthropological and ethnographic. 1. Although this route might be safer because of the absence of a sea to cross, parts of the journey are already managed by traffickers. Organised structures aimed at gaining profit have already organised direct bus transfers for the refugees from Murmansk airport (where they arrive on their own) directly the border. The local buses running would not be able to cope with the amount of people to arrive, and the state or NGO’s do not offer a such transports. So, on the one hand, those transfers are welcome by the refugees, but on the other hand, the prices are many times higher than what a regular citizen would have to pay for the same route. 2. The Norwegian’s right-wing populist’s argument that winter will do its job and prevent the refugees from cycling to Norway is most probably void,. The Russian traffickers have already provided a seamless chain, which means that the bikes are transported in the minibuses together with the refugees directly until the Russian border post. From there they have to cycle only for 200 meters, which is basically possible even with improper clothing and very cold temperatures. This story would be such a lovely case for a cross-border ethnography. It’s got all the ingredients of a classical connection between issues of governance, geopolitics, as well as climate studies (now that we have cold temperature and it’s life-dangerous for people to wait at the border), and local social change. Some grounded theory fieldwork would be great. Just who has time and money to do this?